CLARIFICATION: The MyPriceLink program gives GM the capability to change OEM list prices quickly in the estimating systems. An earlier version of this article was confusing on this point and has been changed accordingly. 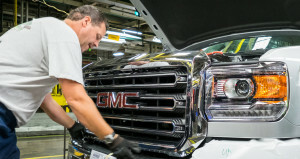 General Motors has begun testing fluctuating prices in its MyPriceLink pilot, and the company remains on track for a full launch of the OEM parts program this year, an executive said Thursday. The pilot launched three weeks ago in Denver with static prices, and the dynamic pricing tests began Monday, GM General Director Kris Mayer said during a Guild21 conference call. “I’m happy to report that everything seems to be working OK” said Mayer, who oversees GM’s dealer wholesale channel for customer care and aftersales. No formal date has been officially announced for MyPriceLink’s grand opening, but Mayer reiterated the company’s July 24 NACE prediction that MyPriceLink would be ready possibly as early as October, and likely no later than Dec. 31. GM hopes to have it done before the winter starts flooding body shops with crash business. “We’ll make sure that we’re comfortable (before launching),” Mayer said. Mayer on Thursday also addressed some concerns and postulated a few features the program — which by all accounts seems to be seamlessly integrated into the three estimating services — could offer in the future. “We can be much more nimble in our pricing strategy going forward,” Mayer said. A repairer prepares an estimate in Mitchell, CCC, or AudaExplore, and the OEM list price populates with whatever new cost GM has set. That’s it, according to representatives from the estimating services. “It’s really not much of a process change from a shop level,” said Mayer. At most, there’s a half-second or second pause while the system looks up the GM price bid, he said. “It’s very clear that every OE has responsibility to that owner, to that vehicle, throughout the lifetime of that vehicle,” Mayer said. He also theorized that the service might raise customer satisfaction and cut cycle times, which means GM at the very least knows what the collision repair/auto insurance magic words are these days. Only collision parts are included in MyPriceLink, and not all of them made the cut. GM has about 92,000 collision parts in its portfolio, and only 7,000-8,000 were identified as “highly competitive parts,” according to Mayer. “We’re not eliminating list price, first of all,” Mayer said. The list price will just change on a “per-estimate basis” if GM feels it can be competitive with non-new OEM vendors. “We feel like we have a pretty good representation,” he said. 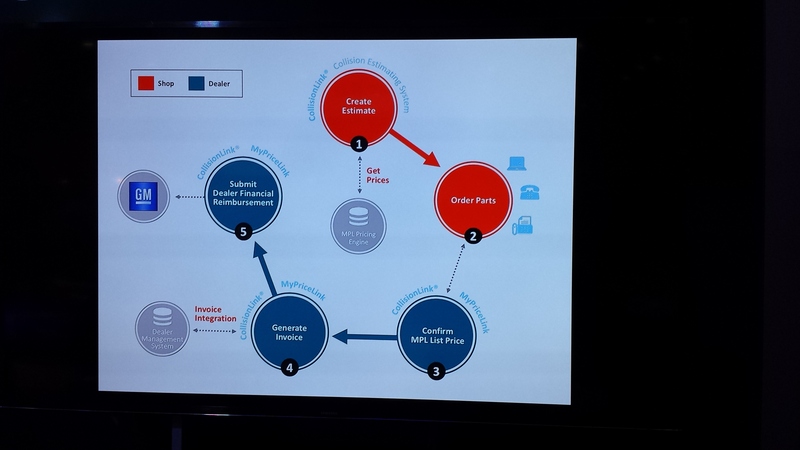 As for the privacy concerns with GM’s integration with the estimating services, Mayer stressed that GM — really, it’s OEConnection that’s the clearinghouse, he said — doesn’t get proprietary information. “We won’t even accept it,” he said. The entire EMS file isn’t transmitted, Mayer said. GM only needs certain fields transmitted, such as VIN number, age of vehicle and mileage. “It helps us render a price,” he said. He also said GM understood the need for it, suppliers and collision repairers to all earn a margin. “We don’t plan on doing anything stupid or crazy,” he said. “If we can do dynamic price, we can probably do some of those other things just as easy,” he said. For example, he said, some VIN decoders aren’t as good as they could be, leaving shops trying to figure out what options exist on the vehicle. But GM can look at the VIN number, know exactly what it contains, and commuicate that information via the estimating service. Another option could be communicating repair information to the shops via their estimating service, something Toyota and Tesla are already doing with Mitchell and AudaExplore, respectively.